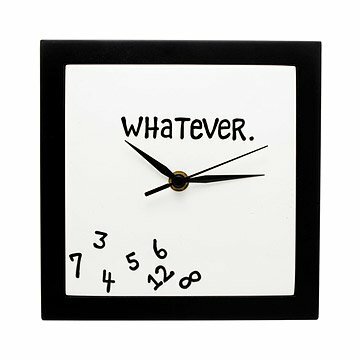 This quirky wall clock tells time like no other, featuring the words "whatever" in place of numbers. What time is it? What time does it have to be done by? What time are you supposed to be there? Sometimes, you just have to say "Whatever." There's no need to fall in lockstep with the regimens of the bustling bodies outside: With this "whatever" clock you can reject their meticulous punctualities and chronological obsessions, and just say that one word that can answer all their questions. The "whatever" clock can be mounted on any wall. Imported. Made in China. This was a great retirement gift for my father! I bought this clock to replace the exact same clock I had received as a retirement gift several years ago. I appreciate the humor. Can't wait to give this to my sister as "whatever" is her favorite word!! I checked out the clock to make sure all was well, and it is so well made and looks great. I'm going to purchase more later. It perfect. What a conversation starter! I Love this clock. It is unusual and a conversation piece. I have bought several items from Uncommongoods and have loved everything that I've purchased from them. Best ever, I would buy as gift, luv it so much. I did not purchase this as it was a gift, but what a wonderful gift, it just keeps running like a timex. hahahaha. I really do like it and always think of the friend who gave to me. Keep up the good work. I HAVE bought several of this clever product. What is the most amazing thing about this unique clock is that it keeps perfect time! Also enjoy the second hand and its precise 60 moves each minute. This clock has a unique design, and it is just beautiful. The quality is very high. This is great for someone who needs to chill out a little bit about time, relax, and enjoy life. My circle of friends has a wonderful sense of humor and they think this clock is awesome.